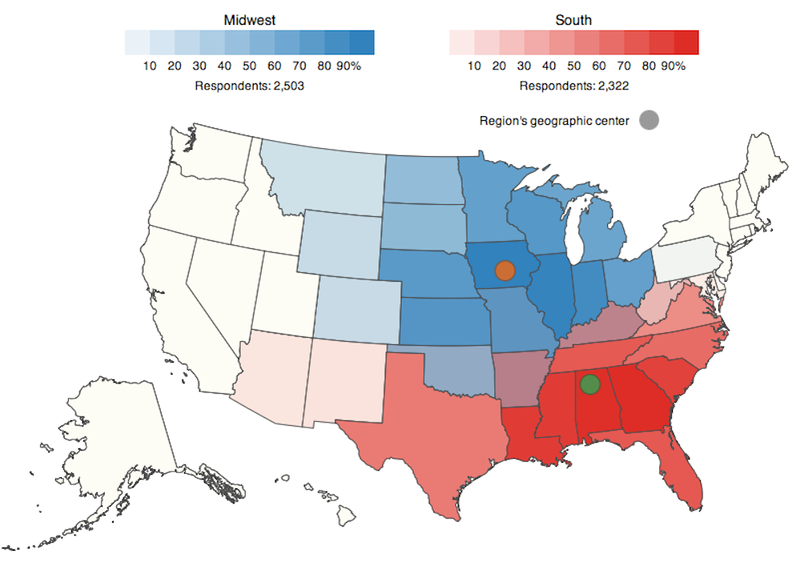 Last week, we published the data from two surveys asking Americans which states are in the Midwest and the South. We asked readers to send in remixes they made or any they came across; you folks delivered. But Stancil wasn’t finished. 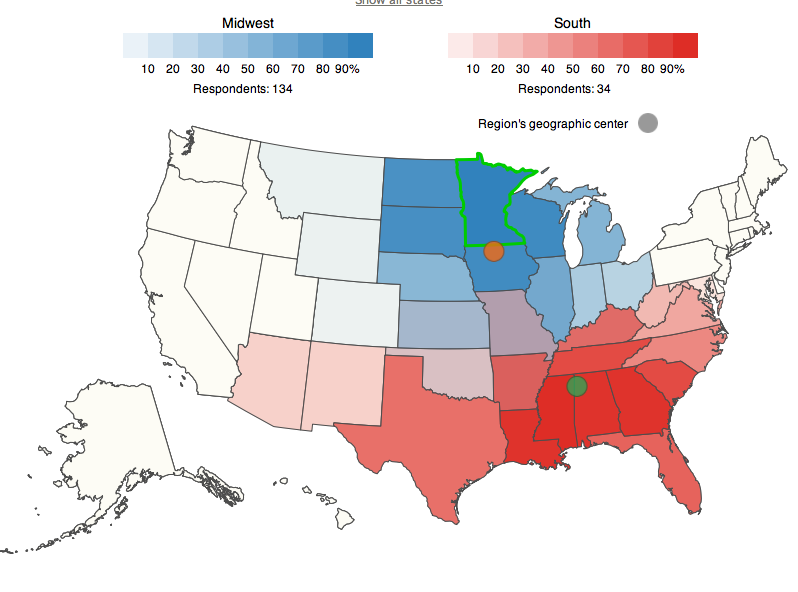 You may recall that in our original post on the Midwest, I was surprised by how little consensus there was about which states were Midwestern. My unsupported theory: Self-identified Midwesterners define their region as their home state, plus the states bordering it. Looking at Stancil’s breakdown we can actually see that effect! 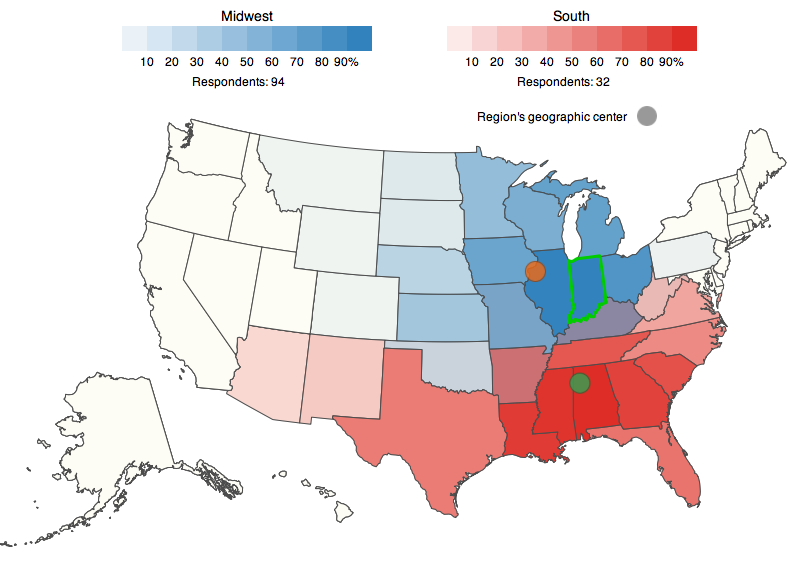 Notice that the geographic center of the Midwest according to each state’s respondents is much closer to their own state. Notably, the four lists that didn’t include Alabama, Mississippi, and Georgia were of identical composition: each only had *one* state on it: Texas. 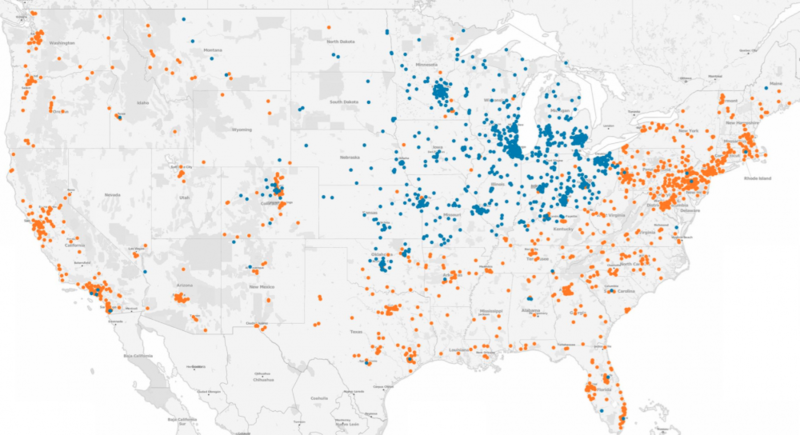 Using only the respondent’s ZIP code, I trained a model that predicts with close to 80% accuracy whether a respondent identifies as a Midwesterner. My definition of “identifies as a Midwesterner” is someone who either 1) used the word “midwest” (or “mid-west”, “mid west”, etc) in their free text response, or 2) said they identify “a lot” as a Midwesterner. Next up we have the always great David Mendoza, who used fusion tables to analyze the ZIP code data. 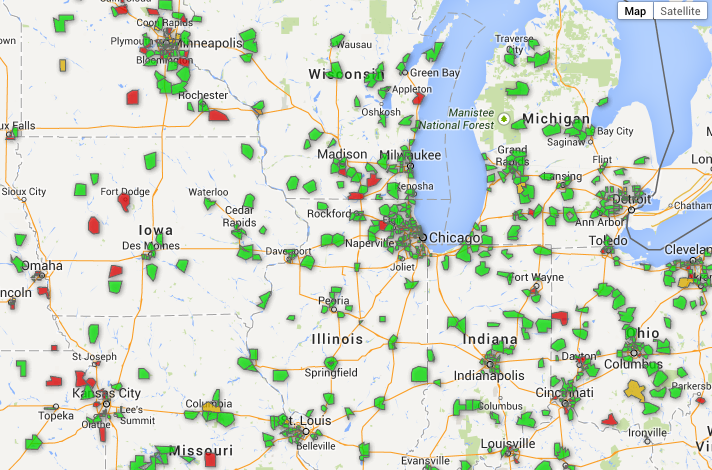 Screenshots don’t do his interactive maps justice, so definitely check them out here. Mendoza also took a bold stab at the Missouri question (Missouri didn’t seem to be included in either the South or the Midwest). Mendoza found Missourians consider themselves proud Midwesterners, not Southerners, no matter what anybody else says. If we missed your remix, please shoot me an email at walter.hickey@fivethirtyeight.com. The data remains available, too, for those who want to jump in.